Every board has a threaded steel rod protruding through its entire length, holding together the solid 1 ¾” thick sections. These rods are accompanied by washers, lock washers, bolts and then cranked to maximum tension. This tension ensures the piece will never split due to overwhelming environmental and physical abuse over time. Wood breathes throughout the seasons and our boards should be tightened often by the customer. 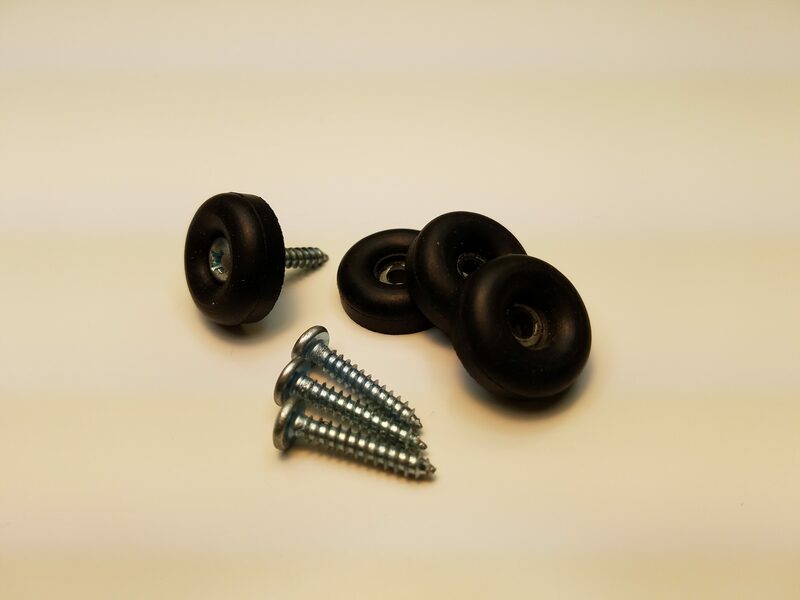 Removable color coated metal buttons or nut-covers disguise the recessed holes containing the rod and bolt assembly. 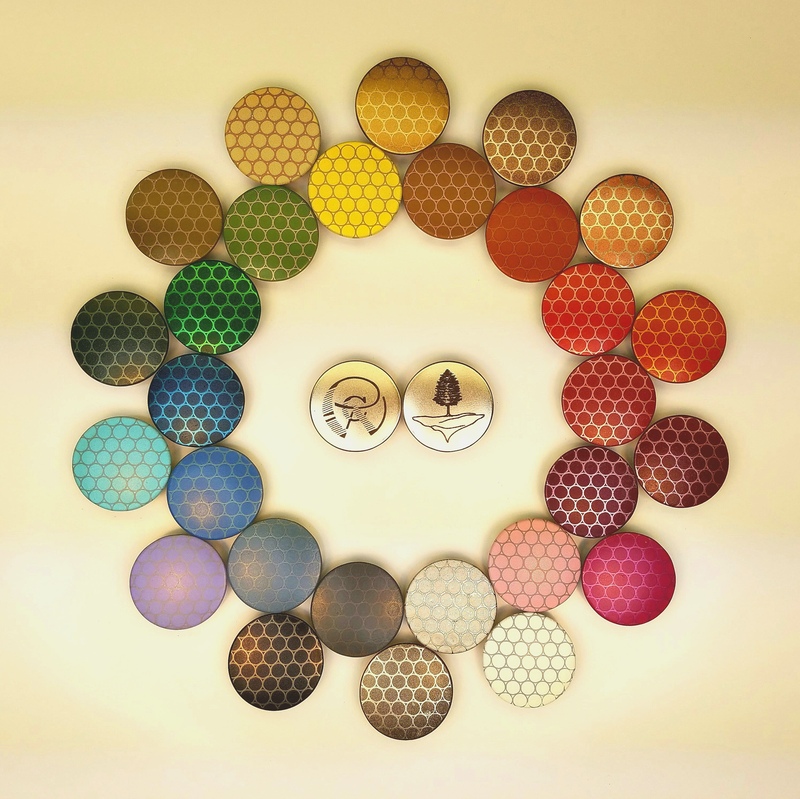 Most boards start with a nickel coated button and can come in a variety of colors, along with personalized etches designs. These help to accompany the different hues in the wood or to the décor and details in your kitchen. 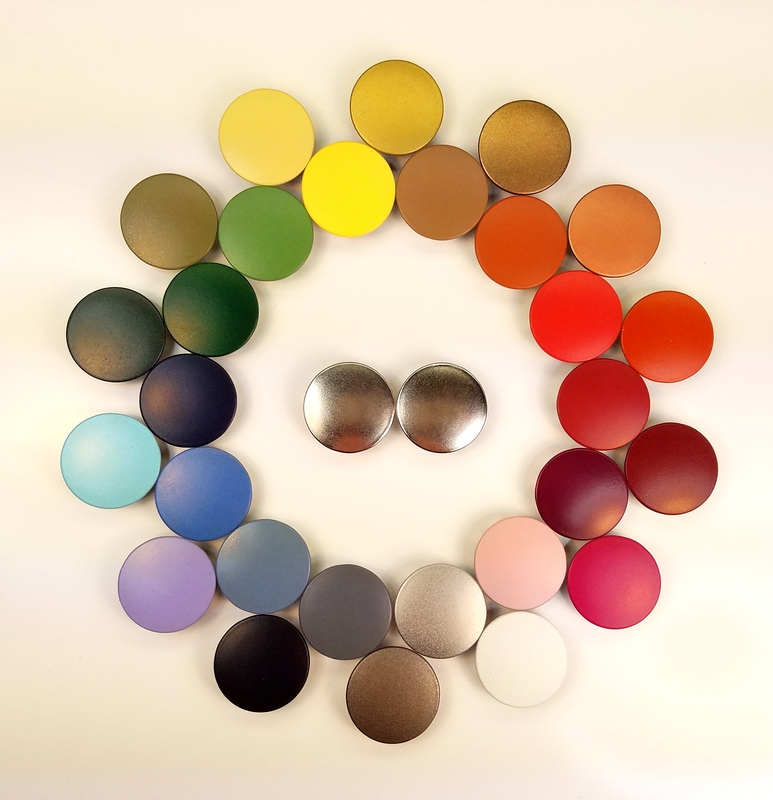 Buttons can also be upgraded to a heavy machined nut-cover that adds an enhanced industrial element to the design. Pine Cliff uses selectively harvested domestic hardwoods, exotics and some reclaimed woods. At our shop, we efficiently dry our wood in an 8’ x 30’ double bay kiln that stores over 5,000 board feet. After being dried, it is processed and turned into functional pieces of art. Common domestic species include: Ash, Cherry, Maple, Oak and Walnut. 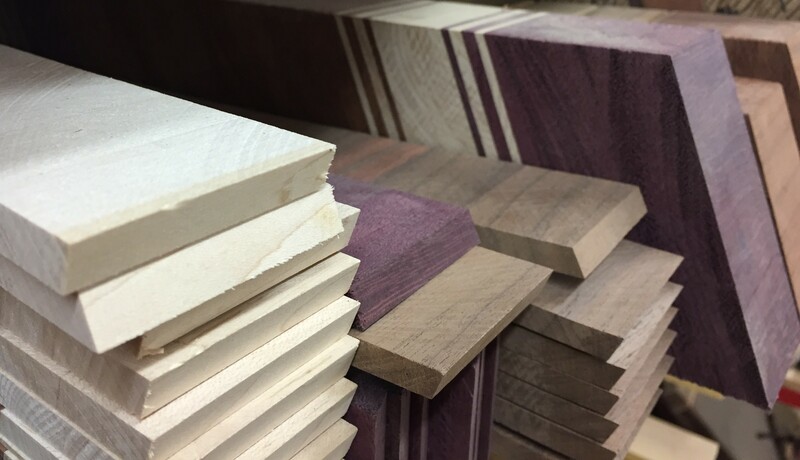 Exotics used: African Mahogany, Brazilian cherry, Bubinga, Lyptus, Purpleheart, Wenge, Yellowheart and Zembrano. Stabilization is a procedure used to harden and change the hue of certain woods. This is a process that involves a biodegradable juice called Cactus Juice which is used as a hardener. It is infused into the grain using air pressure. After the wood is completely saturated with juice, it’s baked into the fibers and pores. The stabilizer is then locked into the grain and will never bleed. This time-consuming task is well worth the effort involved. It enhances the grains and increases the chatoyancy levels of some woods to their maximum potential sheen. This process is done only to the accent and/or border strips, not the chopping area. 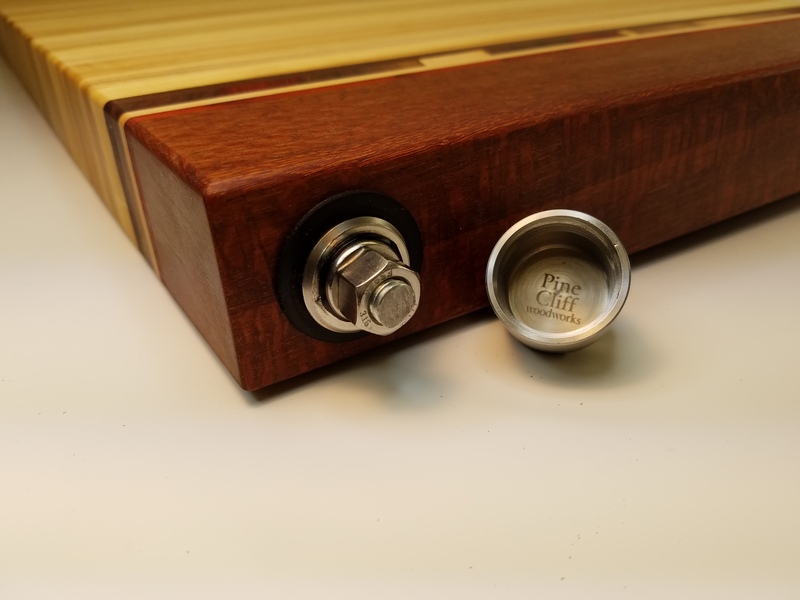 Ask about stabilizing your board in the comment/requests box after designing! 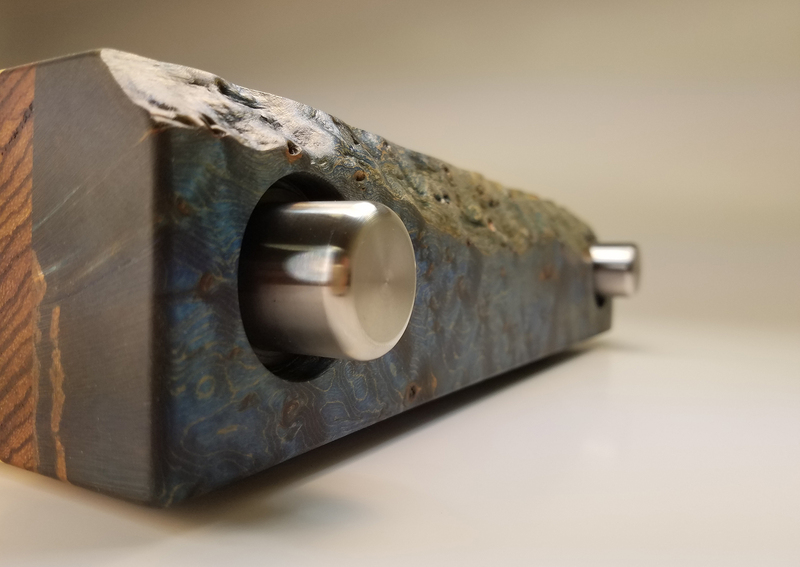 All our handles are custom built and expertly attached to your board. We offer stainless steel handles that are securely mounted with high tensile steel bolts for long lasting support. Our Dado and Shaped handles are crafted from your board, making them feel as if they were cut directly from the tree. Adorn your board with an Elk Horn handle for that rustic, log cabin feel. Add a juice groove to your board surface to keep runaway liquids at bay and off your counters. 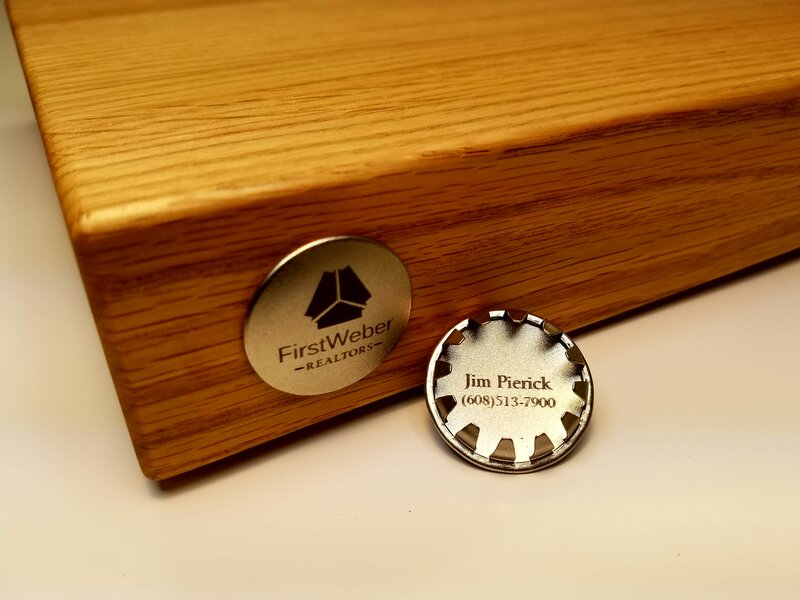 This feature adds a decorative element to any board while being extremely functional as well. Grooves can be added around the entire circumference of the board, only on a single edge, or any combination. 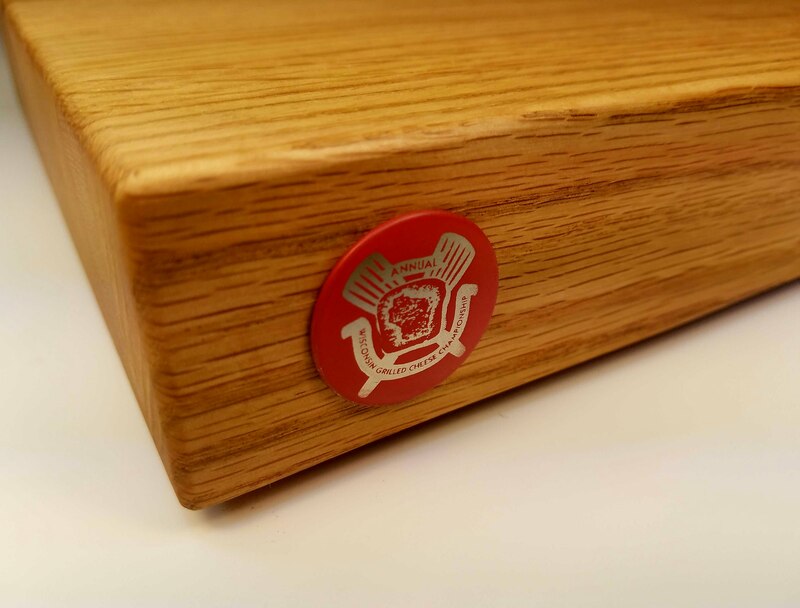 There are a variety of additional accessories associated with our custom cutting boards. The accompanying feet are a necessity to protect against any surface. 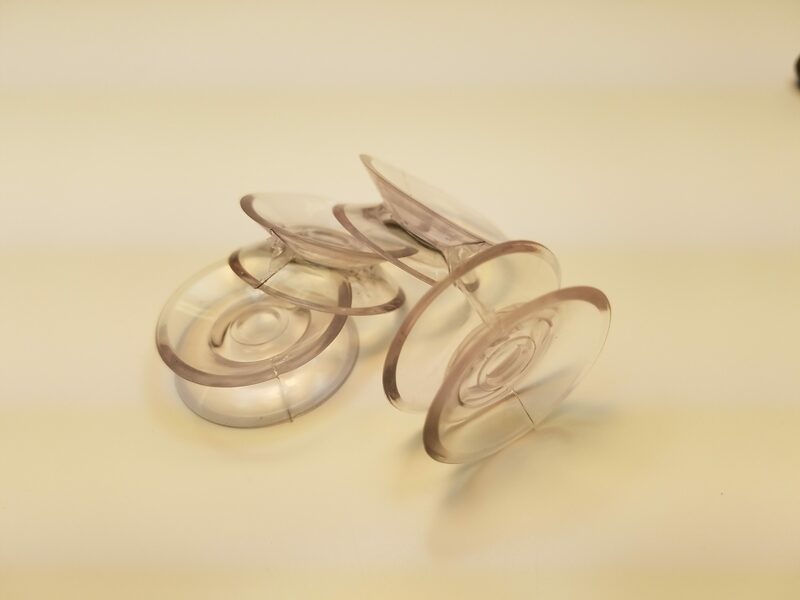 Choose between double sided suction cups that work great for reversible boards, or screw on rubber feet for a non-reversible version. 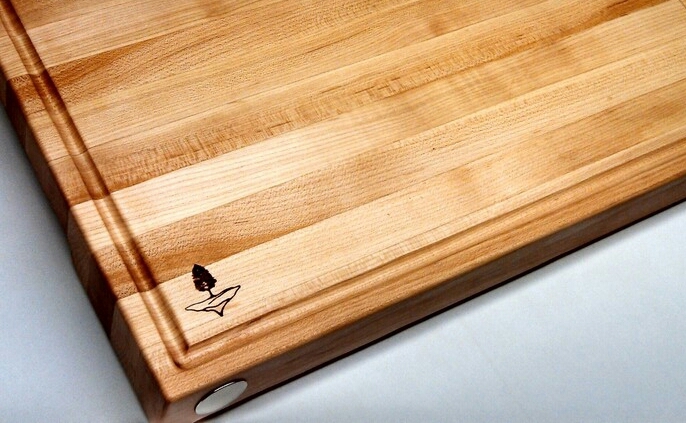 Handles can add a lovely touch to your custom cutting board for effective daily use and mobility. We offer handles like the common shaped finger groove, exotic turned and dado wooden pieces, all the way up to elk horn handles with matching exotic wooden caps. A juice groove is a small reservoir milled around the profile of the board used for gathering and using food juices. They also give a unique functional feature to these elegant pieces of art. We offer multiple sizes in several different locations and configurations. It’s your tool. Configure it your way – to your preference.